Conventional thinking might lead you to create original content each and every time but that doesn't always have to be the case. To save you needed time and energy, try reposting or recycling content that has performed well in the past. Success will not happen in a vacuum. It is up to you to reach to other industry influencers to amplify the content you are posting. Cisco partners with several other industry leaders to amplify and reach different audiences with their content. 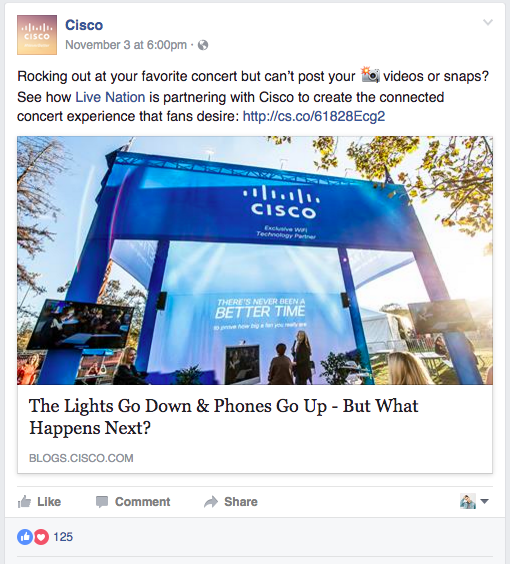 Cisco partnered with Live Nation to power and connect concert experiences for music lovers. Who can you partner with for a similar win-win type situation? Are there similar businesses that reach an adjacent audience? Increasing the transparency of your content is a simple way to increase the levels of engagement your posts receive. Revealing secrets or methods like the Wishpond team did when we reached the front page of SlideShare is a compelling way to garner conversation. Companies like Groove, Buffer, and Drift use transparency as the driving force behind the content they create. It gives their customers insight into the business and the reasons behind their initiatives. Thus increasing engagement and favour for the content they develop. If your content has hit a roadblock and can't seem to garner much engagement, maybe it's not the content, maybe it's the format. One of the things that makes Facebook such a dynamic platform is the media formats it supports. Video, audio, written, and soon enough, VR. There are many formats to experiment with. 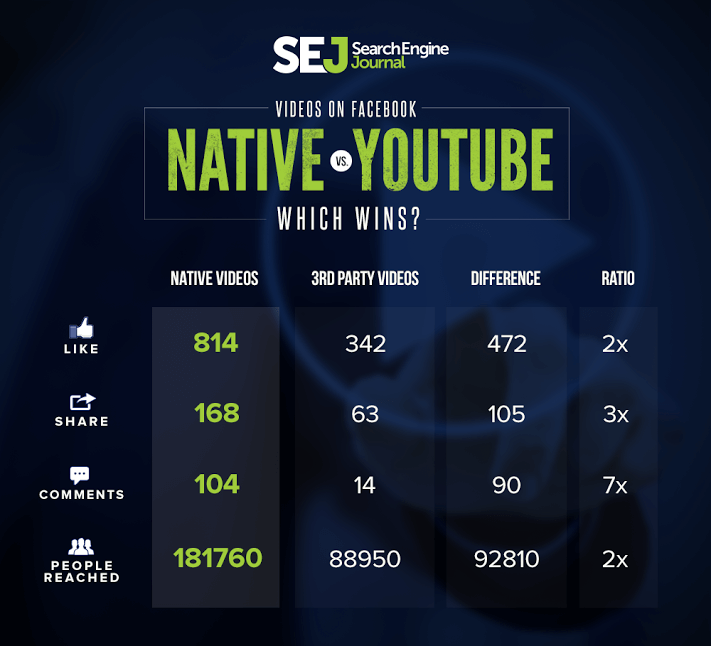 If you're finding your content ignored, it may be time to try out video. A 3,000 word article on SEO can be a little dry for most marketers out there. But turn that article into a video and that's a whole different ball game. 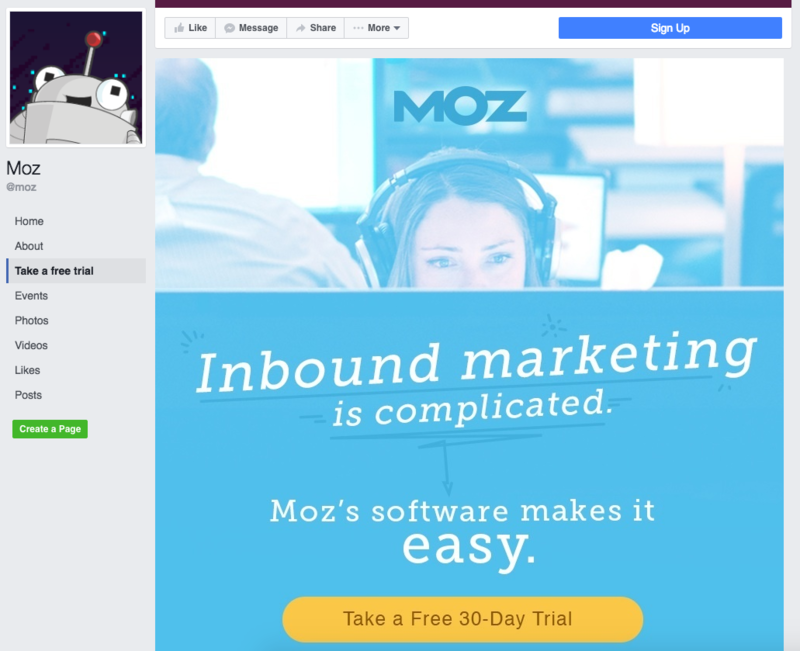 Just look at Moz's Whiteboard Fridays hosted by SEO wizard Rand Fishkin, one of their most anticipated pieces of content. This one might sound like a no-brainer but it's a tactic that most marketers forget: just ask. Crazy right? Sometimes we're so concerned about the content that we forget to prompt readers to act. We might so often assume that the next step is obvious but we shouldn't assume the best. The next step must be blatant. Here's a simple example from Subway. A photo of the beach during the weekday is enough for most viewers to hit the 'like' button. 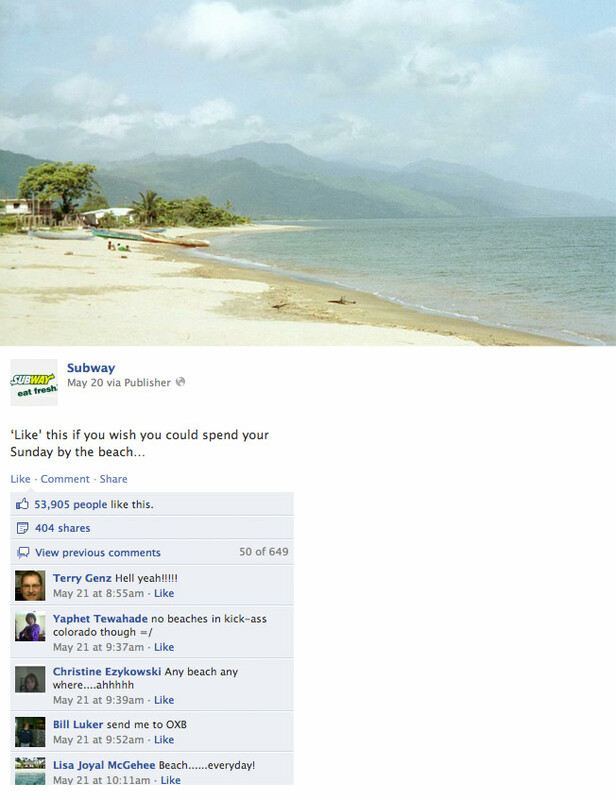 But Subway puts in a bit more by saying hit the 'like' button if you could spend your day at the beach. It's that extra bit that could sway a few more readers to engage with your content. Most, if not all, social networks support the use of emoticons. Using emoticons in status updates, comments, and content has been proven time and time again to increase engagement. A pictures is worth a thousands words they say. Create more of an emotional connection by using emoticons in your status updates and comments. Keep your finger on the pulse and share current news and events with your audience. A hot topic is sure to generate conversion and discussion. Facebook allows the creation of custom tabs on your business page that could support a various amount of functions. A social contest tab, for example, can boost engagement amongst your audience tenfold. With some help from a developer you could have your very own custom Facebook tab that engages your audience in some function or send traffic back to your website. What better way to engage with your audience than to do it live. Facebook's new live streaming features allows you to stream live and interact with your audience directly. One of the ways to boost your engagement is with a live chat. 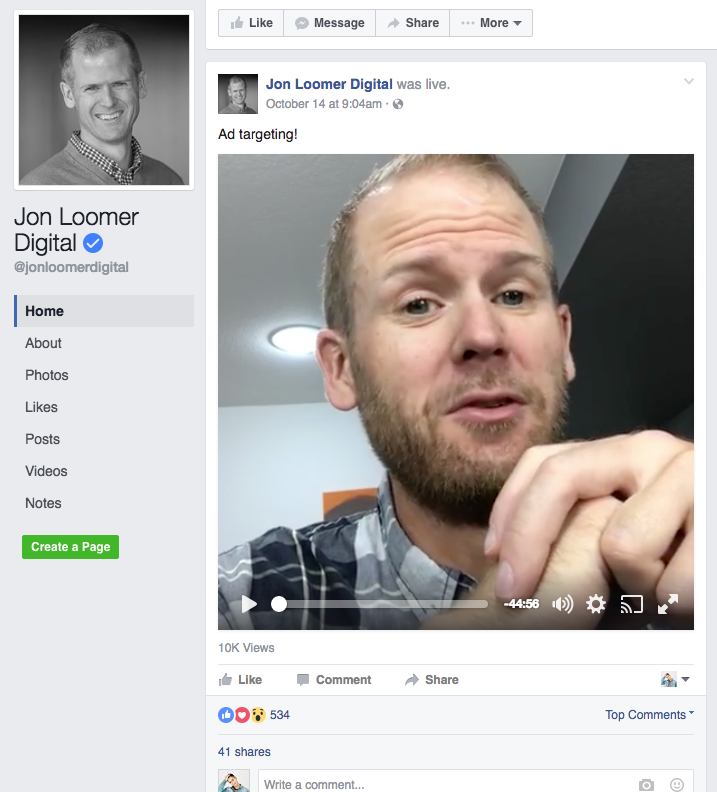 Jon Loomer engages with his audience weekly on everything surround Facebook marketing. Take your audience on a live journey inside your office or just sit and have a heart to heart. The options are endless. Similar to a live chat, a live stream doesn't require much time at all. Simply set up your camera and let the action roll. An epic event can let viewers who couldn't attend watch. A press conference before an event let's viewers attend without press badges. 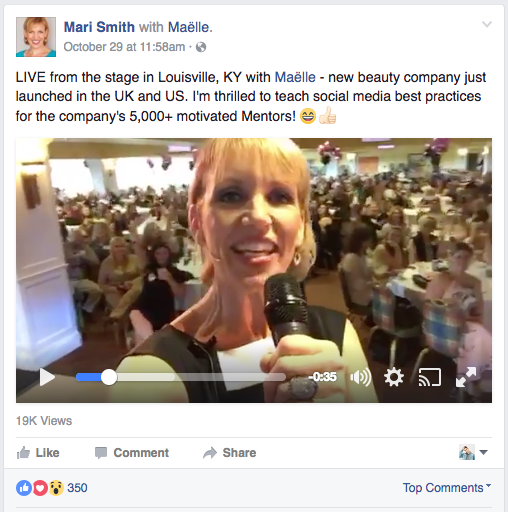 Social media influencer Mari Smith live streams many of her speaking engagements for her Facebook audience. Each and everyone one of her fans can tune in a learn along with the crowd. Organize a Q&A for your audience right on your Facebook page. Pick a time and date for everyone to attend. Post an update and request that questions be left in the comments. It's as simple as that. A gym for example, could have an expert trainer answer questions about proper exercise and nutrition. As long as you have information to share you have a perfect platform for a Q&A. 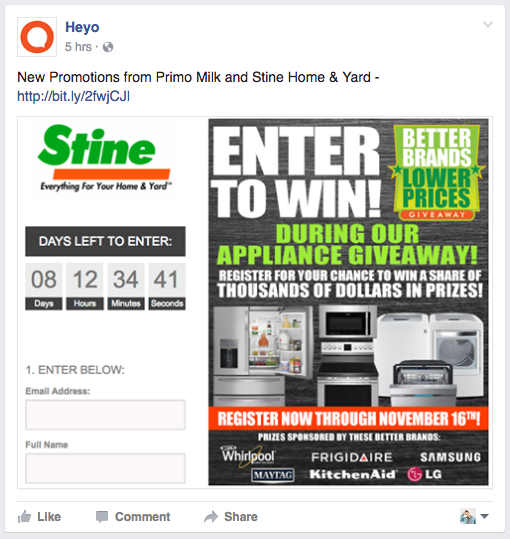 When engagement is concerned, a Facebook contest provides instant results. The steps are straightforward: (1) pick a prize; (2) determine the entry rules and date range; (3) pick a theme; (4) promote your contest; (5) pick a winner. 13. Photo albums or single image? You, a savvy marketer, know that visual content performs better than non-visual content. But what performs better with your audience, single images or photo albums? Test this with your audience. Instead of posting one photo a day, post an entire album on one day and see which is more well received. Apart from slacking off at work, most people aren't browsing Facebook every hour of the day. In your Facebook analytics you'll be able to see the hours that your fans are online browsing. Limit your posting to the hours when the majority of your fans are on Facebook. Though most of what is shown is based on Facebook's algorithm posting at the right hours should give your fresh content a boost. Pinning an important post to the top of your Facebook page feed will make sure it's the first thing seen by visitors thus it will be engaged with most. A new promotion, contest, or sale for example could be pinned to the top for those looking for more information on your Facebook business page. 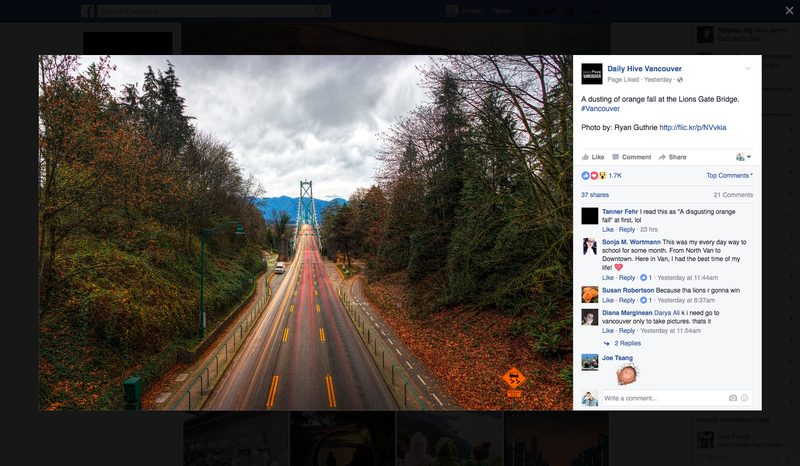 Most marketers miss a big opportunity with their Facebook cover image. Instead of using a random feel-good photo for your Facebook cover image, take the opportunity to add some branding. This could mean a branded photo or some additional text like your domain, Twitter handle, and phone number. It's the largest element on your Facebook page and is the first to draw a visitor's eye. Using the correct dimension for all of your posted visual content simply makes things more visually appealing. Knowing how large to make your cover image, profile photo, ad images, and content come off as more professional to visitors. Blurry images and unreadable text is unforgivable these days so don't make the mistake of ignoring Facebook dimensions. The dimensions change frequently with Facebook's UI changes so your best bet is to Google the latest updates. Sharing awesome content with your network on Facebook is a big engagement driver. If you're producing high quality content regularly on your blog for example, make sure that you've included the proper metadata so that your content looks stellar on Facebook for when it's shared. Facebook calls this metadata Open Graph. Here is the complete information for meta tag Open Graph optimization on Facebook. For those who use WordPress for their blogging purposes, Yoast SEO is a free and awesome plugin that includes all the Open Graph fields for you to easily complete each time you publish a new post. If engagement is your concern a slight change in your copywriting habits is needed. Including a question in your updates and comments is more likely to engage your audience than a statement. Try asking your audience something that they'd like to voice their opinions about. Video is set to become a massive part of Facebook in the next 5 years experts say. It's time to jump onto the video train by focusing your efforts on engaging video content. The low cost and low barriers to entry make producing video as simple as opening up the camera on your phone. 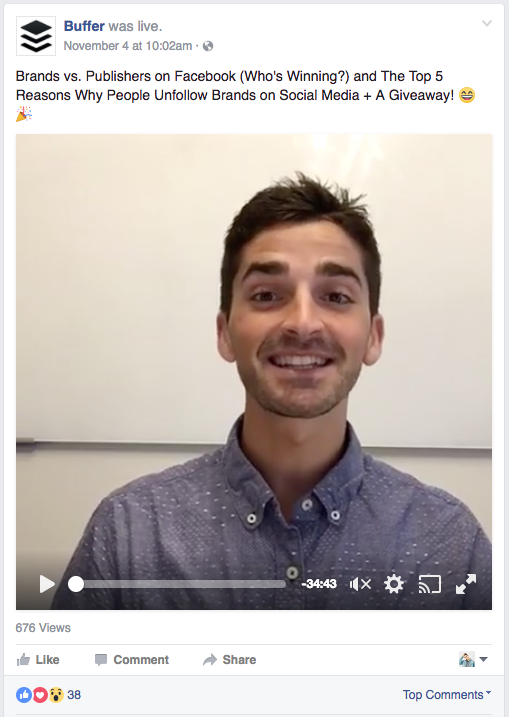 The social media wizards over at Buffer use the full gamut of video on their Facebook page. Live chats, streaming, and high quality video content make an appearance weekly on their feed. Pro tip: Post your videos natively to Facebook instead of using YouTube to be in favour with Facebook's algorithm. Here's a tip that takes minutes to complete and provides plenty of return. Complete and optimize your about page to help your visitors. Your page will become more search friendly. Your business information will be easy to find. Your audience can learn more about your story and what values you stand for. Because most pages were created ages ago, many forget to complete and update their about page with the entirety of their business information. Help your visitors out and keep those interested satisfied by creating an awesome about page. GIFs are hot haven't you heard? Look to any social media platform and you'll find funny GIFs just begging for a play. GIFs add an element of excitement to your content and brighten up your Facebook feed with some lighthearted fun. Experiment with GIF's the next time you post a new update or announce a new promotion. You'll be surprised at how much more attention it receives. 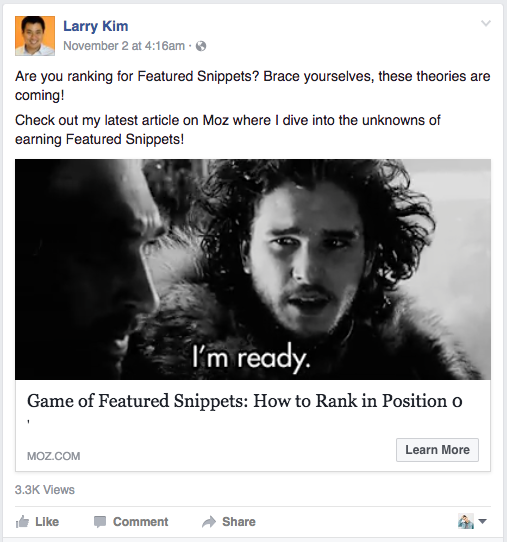 WordStream head honcho Larry Kim is a big believer in the power of GIFs. Larry attaches funny GIFs to many of his updates to add relatability and fun to his content. Though many of us work for the weekend you Facebook feed shouldn't. The weekend is prime opportunity to provide more value for your audience. Schedule post in the handy drop down menu on your Facebook feed and take advantage of 2 more days of engagement. Start with 3 pieces of content and plug them into Facebook's powerful ad network to see which performs best with your target audience. This low cost method of testing content will accomplish 2 things: (1) you'll see what content resonates most with your target audience; (2) you can double down on what works and eliminate what doesn't. 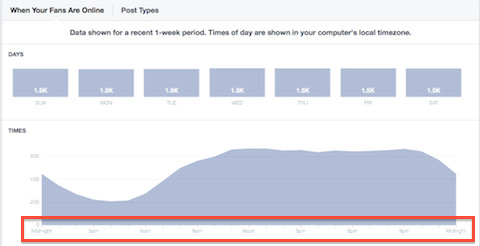 Posting frequency is affecting your Facebook reach more than you know. If engagement is low it could be you're posting too much. Bombarding news feeds can quickly make your content seem low value thus be ignored. Experiment with posting frequency on Facebook to see what formula creates the most engagement for your content. A fill-in-the-blank statement can elicit conversation from your followers. Attaching a fun quote or statement will get followers to add in their own creative suggestions. 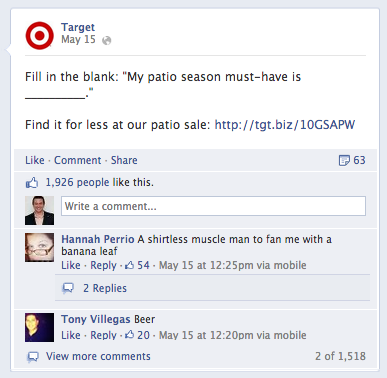 Target used a fill-in-the-blank to engage summer lovers and mention their patio furniture sale. Going behind the curtain of your business will give your followers a little access and improve your transparency. Allowing them to see how business decisions are made or how the product is produced can do wonders for engagement. 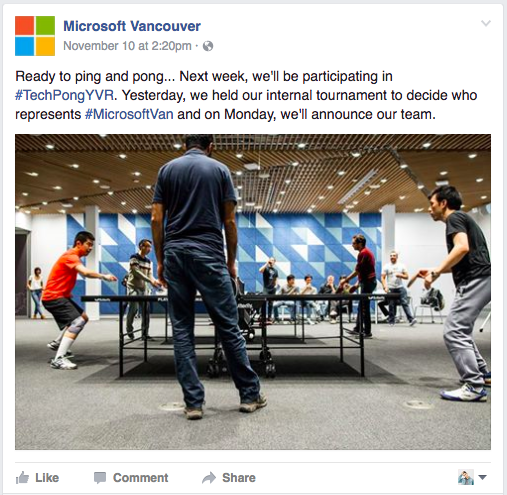 The folks at Microsoft Vancouver are always giving their audience the inside scoop on happenings inside the office. It creates familiarity with the brand. Collecting user generated content allows your fans to join in on the fun. You get awesome free content to use on your social networks and your fans get to participate. Win-win. By allowing your fans to participate they become more invested in your content. Users become part of your brand's story and help you tell it. In line with their branding The Daily Hive Vancouver features local Vancouver photographers to help them showcase the city. Local photographers receive massive exposure and The Daily Hive receive awesome content to use around their networks. An upcoming holiday is the perfect opportunity to create some engagement. Applebee's is known for their smart use of customer content. With Halloween coming up, they asked their customers for costume photos. 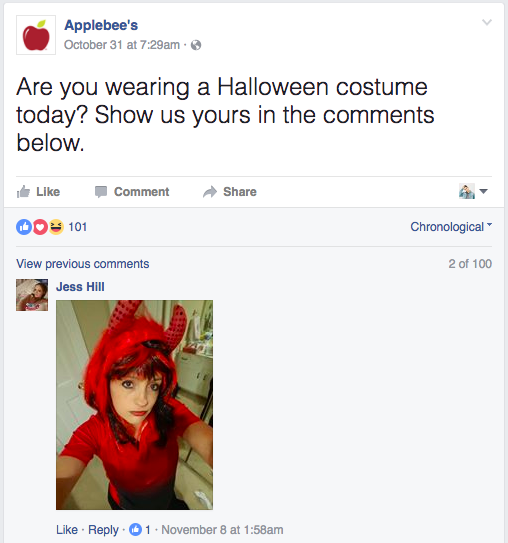 It was light hearted engagement that allowed Applebee's to become part of the fun. 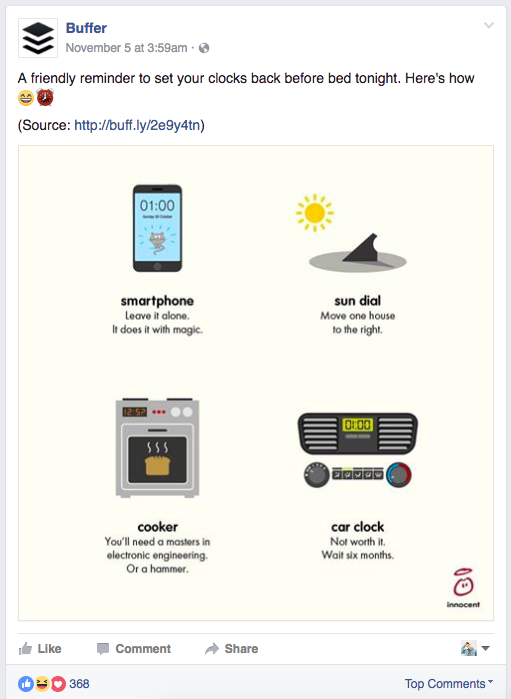 Depending on your brand voice, humour might be just what your Facebook posts need to create engagement. Including GIFs or funny videos or comments can really spark conversation. Remember the ice bucket challenge? This was a way for fans and brands to participate all at once. It was for a great cause and allowed many brands to show of their humorous sides. Many brands are guilty of ignoring follower comments and reviews and they wonder why their post go ignored. Making sure that you're present on your Facebook page is a key indicator for many people of how receptive a brand is online. This means responding to comments and creating conversation with followers. Working with other partners to create co-branded content like blog posts or even live webinars is a great way to reach and engage with new people. 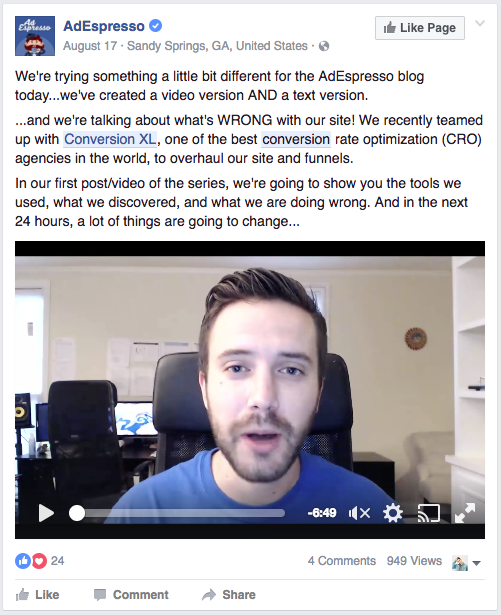 In this example AdEspresso teamed up with Conversion XL and released a series of videos on their Facebook page. It was a smart way for the two to engage both of their audiences and share in the engagement. A group of likeminded individuals can all gather in your very own Facebook group. Organizing, moderating, and growing a Facebook group for your business can be a great way to reach other people with similar interests. It creates a captured audience for your business and confines conversation amongst a similar group of people. Finding a post length sweet spot can be tricky. Some will say longer posts perform better and others short. It's important to test what works best with your audience going forward. Try posting with less information and sometimes with complete information. You can monitor CTR and views to see what performs best and which length is engaged with most. Hashtags are meant to organize the massive amount of content posted to Facebook daily. It's important to include one or two along with your comments for people searching for the topic. Save yourself time and never miss a comment or reply again with a complete social media management tool. Have all of your social media channels organized into one window by using one of the many tools out there. Step up to the big leagues and try industry leaders: Hootsuite, Buffer, SproutSocial, or PostPlanner. 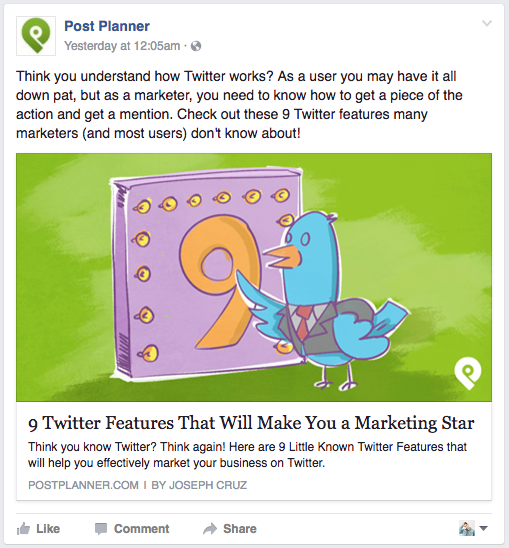 It's easy to get carried away with your Facebook posting schedule. How much original content is optimal? What amount of self promotion is too much? To answer that we use the 70-20-10 rule. That is 70 percent original content, 20 percent shared/curated content, and 10 percent self promotional content. It's a healthy balance of content that is meant to engage, with content that promotes your business. An unbalanced ratio with too much self promotion will drive away audiences and limit your reach. A content curation platform like BuzzSumo allows users to see what content has performed the best in terms of shares across the web. The idea here is to see what has performed well in your industry and attempt to replicate the same success. Plug in a keyword like "long tail keyword strategy" and you'll see what content has been most popular. Next it's up to you to 10x that content and watch the engagement pour in. 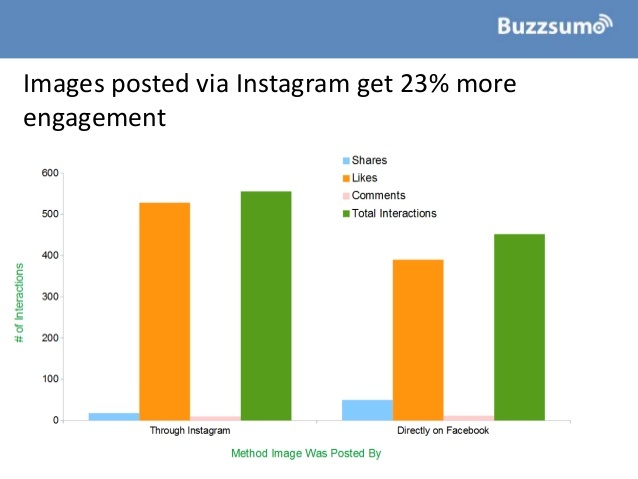 In a study from BuzzSumo, they found that images shared from Instagram to Facebook received 23% more engagement from followers. Opposed to sharing directly on Facebook, these posts may be more visually appealing (filters etc) and receive more reach due to Facebook's engagement algorithm. Try it out and see if the results are similar for yourself. More than half of all web users are browsing from a mobile phone if you haven't heard already. This means you must begin to strategize more for a mobile user than a desktop one. Experiences must be tailored to those that browse quickly, on smaller screens, and even smaller attention spans. Publish posts that are shorter in length and most importantly, share content that is mobile friendly at the minimum. Long load times and large images are a recipe for a quick bounce for mobile users. Make it as easy as possible for your audience to share your content. Seems like a no-brainer right? This means including share widgets on key areas of your website like your blog for your readers. 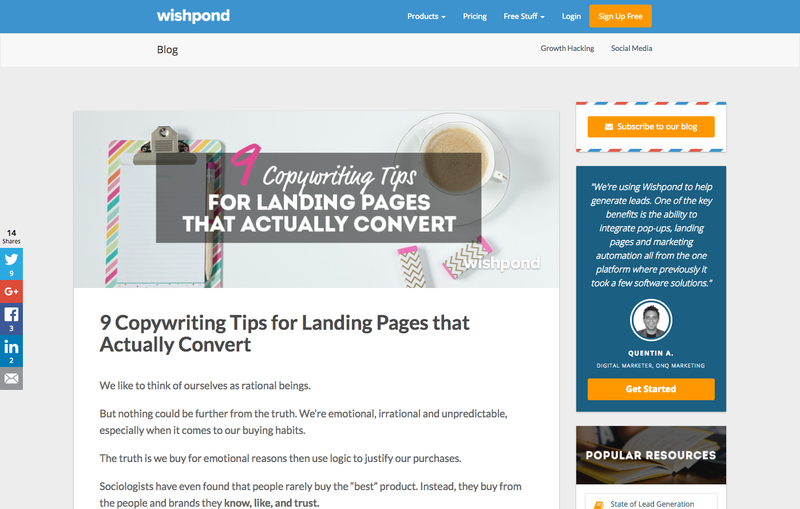 On the Wishpond blog we use a social media sharing widget on the left hand side for our readers to easily share content directly after they've read it. 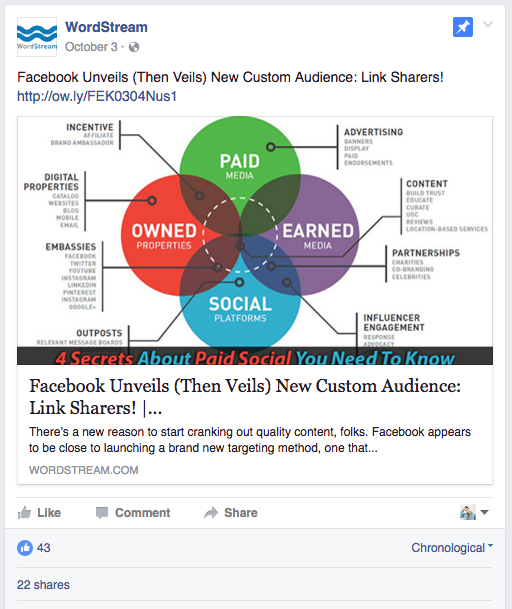 When sharing content you have the option of using a long, short, or no URL at all in the Facebook post. Long URL: Looks a little messy but provides a much more prominent link in the post to click through on. Short URL: Can be created on a URL shortener like Bit.ly. This takes up less post space and looks a little more clean on the post itself. No URL: Once the URL is placed and the populates the post, the link itself can be deleted so that only the post text is left. It removes the unsightly link BUT it means one less CTA for the reader to click. Experiment with each of these 3 options to see what generates the most engagement (clicks) for the content you share on your feed. For co-created content and webinars make sure to tag partner accounts for increased visibility. Tagging included parties and companies, even if they were only mentioned in a blog post, will make your content go much further. Having and using a consistent brand voice helps readers and followers familiarize themselves with your business. A consistent voice and tone is part of your brand and should be used across your brand assets. Slack recently published a piece on finding their Twitter voice and why it matters. As your content gains popularity and shared across the web you want it to fully represent your brand and what it stands for. Your choice of words matter. "Just like me" is a social media copywriting formula to keep in mind when developing posts. For increased engagement it's important to think about how the content you're creating relates to the reader. You want the reader to say, "Hey, that's just like me" when they read your content. An emotional connection and familiarity creates a response. Write for a response. Share your customer successes with your followers. Social media shouldn't be all about you. It should include the people you've set out to help. Demonstrating your value with hard evidence creates connection and discussion. The social contesting platform Heyo shows off successful clients on their Facebook page for their followers to witness. This includes a compelling case study. Highlight the customer and demonstrate value with concrete examples and engagement will come. Go to any health and fitness related Facebook page and you'll see that motivation and inspiration are a priority. Displaying proven results and concrete examples of change motivates others to start on their fitness. You've seen motivational quotes and aspirational images across all of your social networks because they've been proven to create discussion. They create an emotional reaction. Visit the Equinox Facebook page and you'll see nothing but motivation and inspiration. 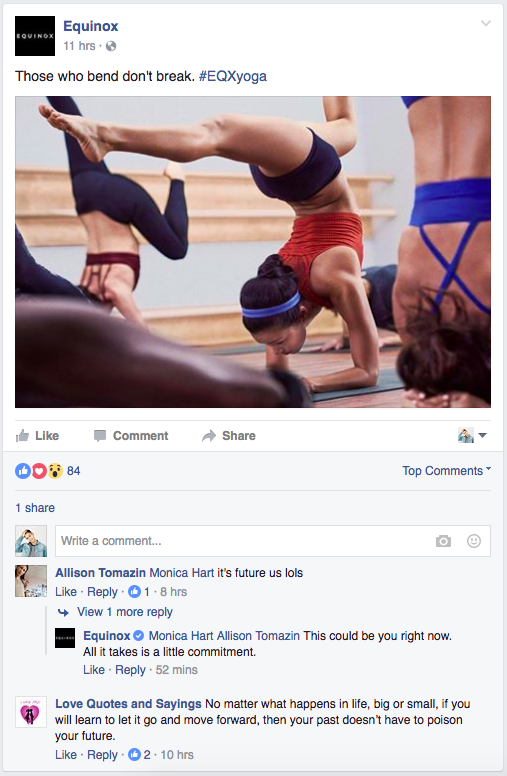 Equinox uses content to push and motivate all of their followers to become better. Beautiful imagery and strong copy makes their content a hotbed for discussion and inclusivity. Feel motivated yet? I know I do. No matter how you spin it, writing is not always the best format for communicating research and data. If you're in the content business of data and research, infographics brings a whole new excitement to the party. A 10,000 word report on the effectiveness of on-page SEO is a snooze-fest for most, but an infographic that visualizes all the data into one succinct image is a godsend. If you're sharing content that most would consider dry, try switching things up with an infographic. Tools like Canva allows anyone to create and publish beautiful infographics in minutes. Create more discussion and make your content more accessible with infographics. Once your content starts getting shared across the web, it's important to remember to brand all of your creative properties so that it may be traced back to you. Highly shared content can sometimes be lost in the fold so it helps to brand your media. PostPlanner makes sure to brand all of their colourful artwork on their blog posts so that it is easily identified. The content rightfully becomes more familiar to their audience and is easily identified with across Facebook for their audience to note. The goal of social media copywriting is to create an emotional reaction between the reader and the content. Emotional words are a powerful tool to create that reaction. Reactions create discussion, plain and simple. What words am I speaking of? 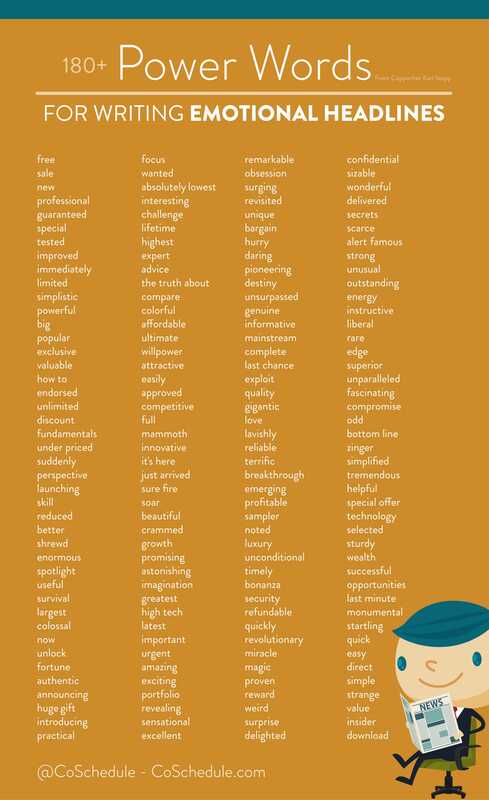 CoSchedule collected 180+ power words for writing emotional headlines. These words are perfect for eliciting a reaction for your short and snappy Facebook posts. See the graphic below for the complete list. Hopefully these 50 tips can help you improve your engagement rates on Facebook. Like with everything in marketing, increasing your engagement requires some testing and experimenting. See what works best with your audience and start from there. That way you can double down on your successes and eliminate everything else. What are some ways you've been improving your engagement on Facebook?